It has been a long, very hot mixed bag of a day, but a good one. Himself woke me at a time I thought was only reached by staying up late, this morning – I may have mentioned I am a night owl, these early hours really ought to be banned. Himself is more an early riser, and, during this dry spell, has taken to watering the garden in the morning (and he doesn’t expect me to – for which I am very grateful! 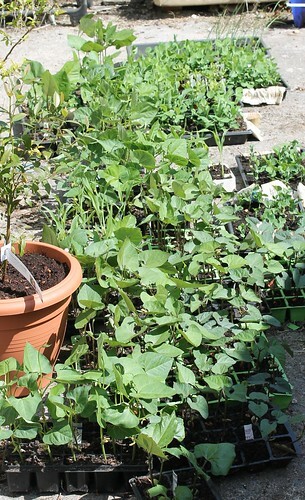 ), the theory being that the water doesn’t encourage the slugs out as it would at night. That and there never seems to be enough time to water in the evening AND do anything vaguely entertaining/social. So anyway, after the watering moment, and the making me get up at daft o’clock (I did ask him to) off we went to market, where we magically changed some pullets into some ducklings. It is the rule of smallholders that generally you should leave a livestock auction with more birds than you brought. 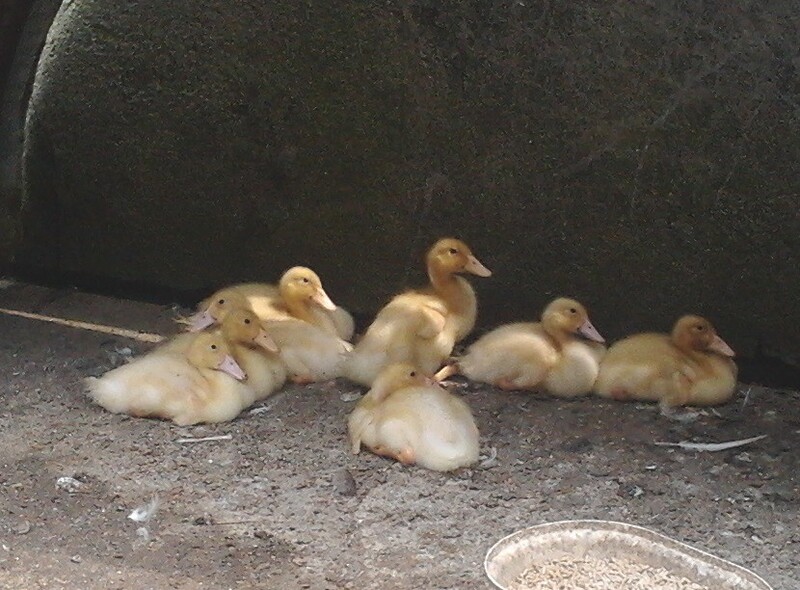 Fortunately it was our intention to sell some chickens and buy some ducklings, and I vaguely remember explaining to himself that if we were going to have some, we might as well get a few… and …well my hand went up a few times and we have nine new ducklings. It was very hot, so I gave them water before we left, and when at home we settled them in the pen they were delighted at the mini pools and set about playing, washing and generally getting very wet. I admit we spent a fair bit of time watching them too. We shall set up the big paddling pool tomorrow, which will delight them no end. 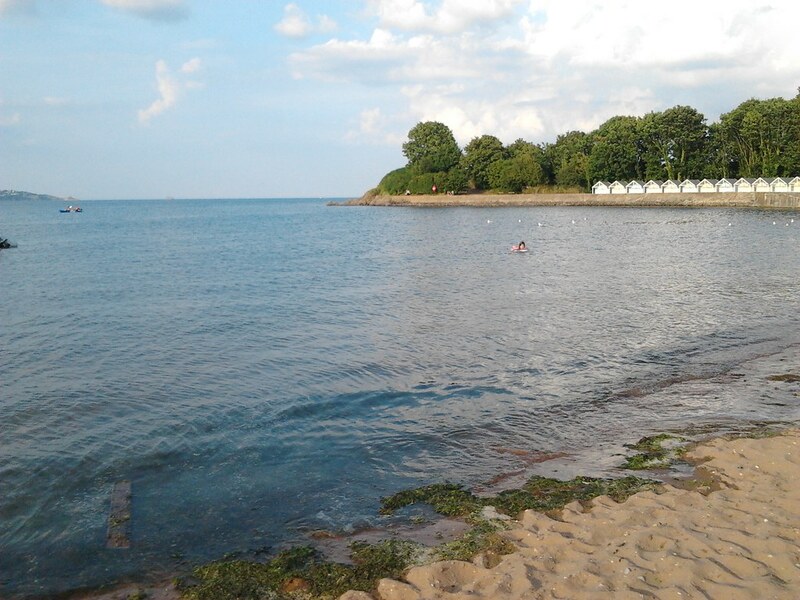 Then, finally, we nipped out for an evening swim in the sea, given that sea temperatures are high at the moment, and although there was some shrieking on getting in the water (from himself obviously), it was just lovely. 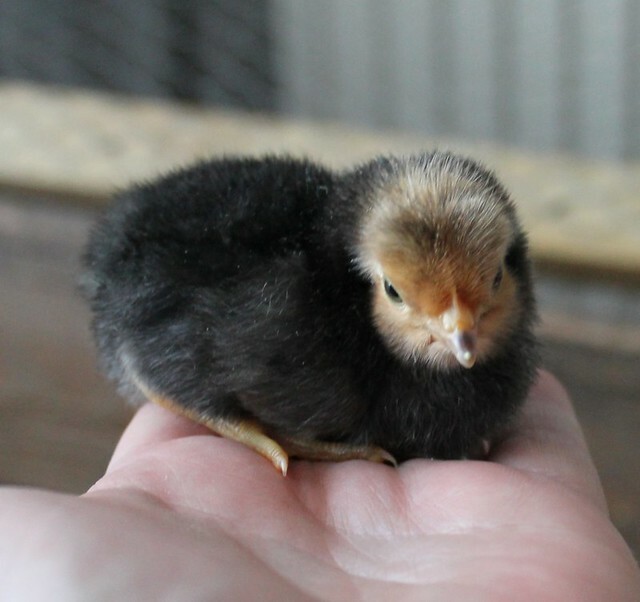 We had a hatch at the weekend, this time a mix of Vorwerks and French blue marans. The Vorwerks were a bit of a whim when I was having a bad day – they are striking looking chicks, with reverse colouring to their future adult plumage. We snuck them under a broody hen and she is a very proud mum. Thankfully we booked the shearer with perfect timing and he came at an unearthly time on Sunday morning and sheared the sheep, and they are now cool sheep. The ducks failed us, and the second hatch only gave us two ducklings.. we may have to pop duck eggs under broody hens at this rate.. but one of the ducks is laying again so we live in hope. Mostly though, it is about the veg, trying to compost and plant and all of the plants want to go in at the same time.. ie NOW! The cold weather suddenly passed and it all became a bit urgent and late too. However we are getting there. We are not, as I have said before, having a lot of duck luck this year. But on one cheery note we have got these two new little Muscovy ducklings now. Against the odds. Their mum abandoned the nest pretty much on the day we expected them to hatch. I saw her off the nest at 10 am and then when I was cutting logs at 2pm, realised she was still off the nest. So yes, the eggs had been left that long. It was a warm day though, which might have made a significant difference. We took 7 of the eggs from the middle of the nest and slipped them under a broody hen. We left the remaining eggs (just too many to fit under a hen) but she never went back to the nest. Four days later we decided the eggs under the hen would come to no good, but at the last moment decided to check just one rather than removing them all to go cold. And sadly that one proved to be a viable duckling, so we left the remaining 6 eggs under the hen. And today I noticed when checking on her that she was ‘talking’ to her eggs. A little poking revealed 2 ducklings. 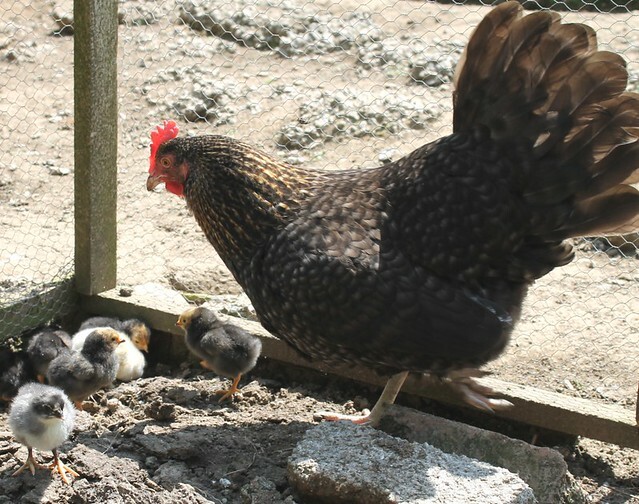 She was still sitting tight firmly, so we left her another day, but it has been so hot, and one of the eggs was clearly bad and broke, and the smell… so we called a halt and moved adoptive mother hen and her two new charges to another coop. One (a boy I’ll bet) decided to lessen his chances further by going walk about, squeezing through a gap in the pen and walking the entire length of our big hen run (which is big!) and into another pen and he was found settled in the sun with some junior chickens. Fool. He was put back with his sibling and mother hen. 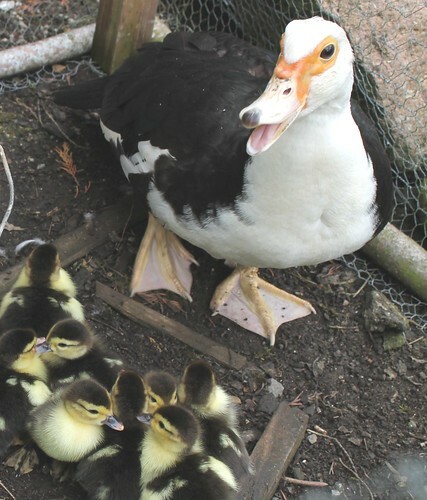 They say ducks make bad mothers, and it is true, even though Muscovy ducks are better than your average duck, they don’t compare to hens.. but I think ducklings are pretty poor compared to chicks. Chicks naturally stay with their mum, and obey her orders.. but ducklings seem to do what they want.. I hope we manage to raise these two at least! 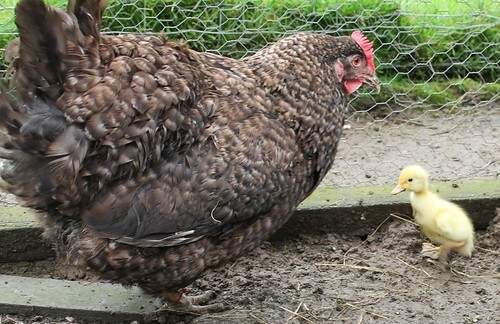 Over the weekend, the broody hen that has been sitting on a clutch of Aylesbury duck eggs emerged from her nest with her pride and joy – a single duckling. We are not having a lot of duck luck this year. A single duckling is not ideal – although it does have it’s ‘mum’ for company for now, I’m not sure how that is going to pan out in the future. Meanwhile Chloe, our Muscovy duck, abandoned her nest on due day. Once again – I think she heard ducklings (the other brood) and left her nest to find them. We are going to have to think of a way to separate them properly next year…. 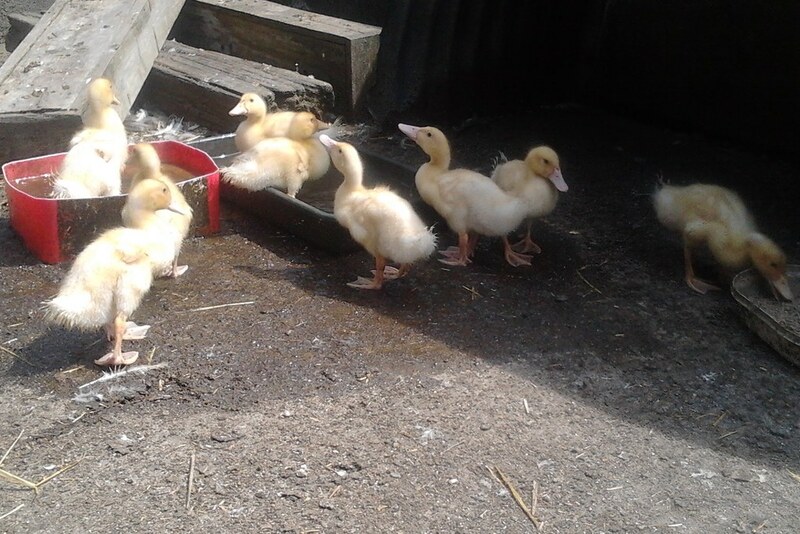 Meanwhile the five older mucovy ducklings are doing well, are gaining their proper feathers and the two mother ducks and Captain Speck the drake look after them well. 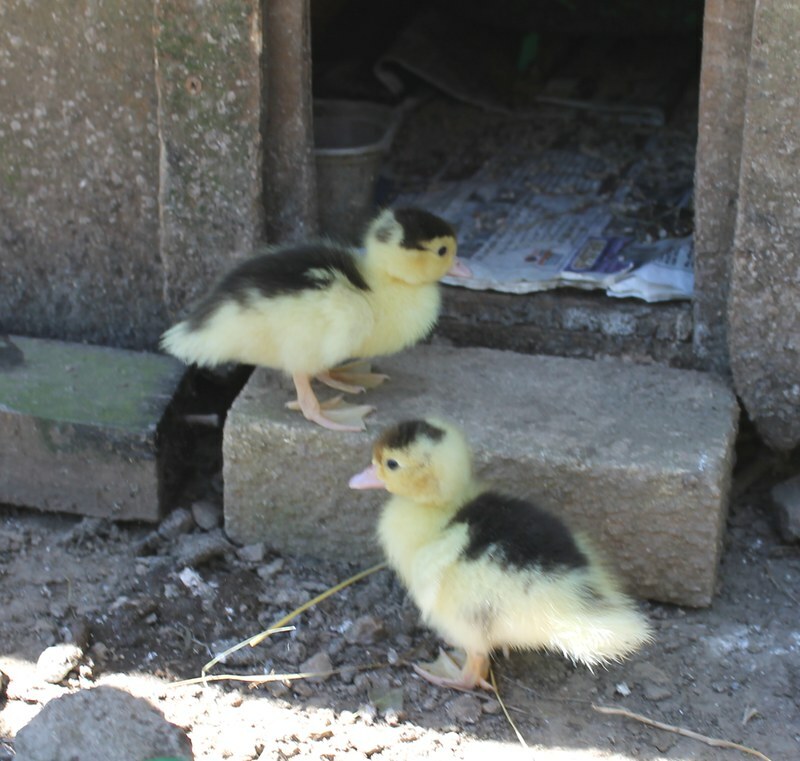 and the fluffly single yellow duckling is doing well, it charges about himself calls it ‘the yellow peril’ whilst I refer to is as ‘Crispy Duck’ – least we forget where we are going with this. Poor old Captain Speck – he has been lonely and moping. The problem is both of his wives have been away, fussing over eggs and ducklings rather than keeping him company. Until a couple of days ago, when we brought Cyco and her brood back. He got very excited – actually a bit threatening – usually perking up that quiff is as far as he goes, but we were holding one of his wifes and she was giving it hell. Much shouting ensued from the pair of ducks. 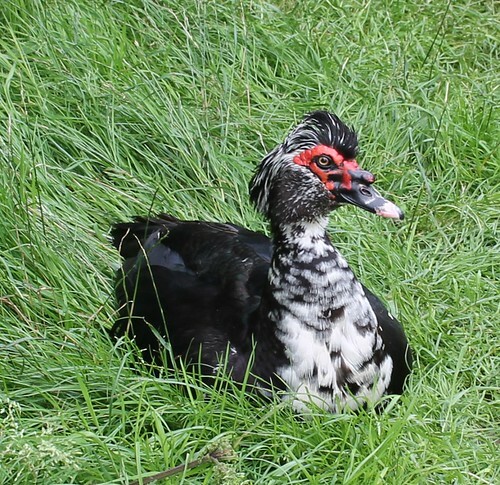 Fortunately, when it comes to Muscovy ducks, the shouting is almost silent. Once we put her in the pen, he felt much better about it, and Cyco felt a lot better about it when we brought her ducklings in. And Himself felt a lot better about it too, as this time he carried the duck in without being pooped on. Duck poo can go a surprisingly long way…..Me, I was carrying in the ducklings which are now two hand efforts of wriggling fluffiness. Speck now sits on the coop keeping guard. He really does seem very attached, and he sticks his head feathers up at us when we come in – that’ll show us.. In a couple of days we shall take the coop away and hopefully he will be fine with them all. A few people have kindly checked in on us as the South West has been in the news with lots of flooding in the area. 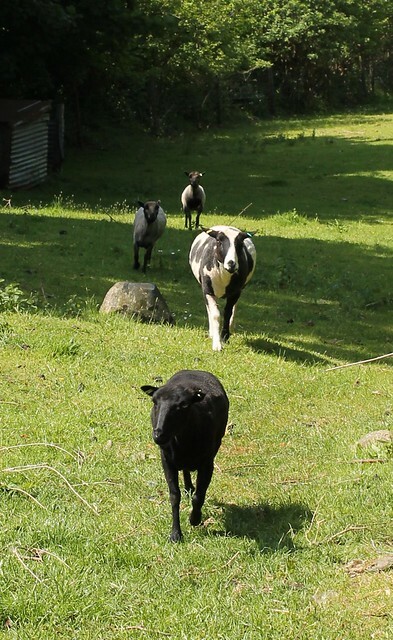 We are fine – it’s all a bit soggy, the chickens are paddling and we have had July’s rainfall overnight, but we are fine – unlike other poor folk lower down. The river is ferocious, and the riverbanks have been reshaped and a few trees that were on the sides, now find themselves as islands. The debris shows the water level was at least a metre and half higher overnight. But we are fortunate in being fairly high up here. The height often makes things different for us – often we still have snow when everywhere is green again. Either way, the older ducks will have to move out of their warm indoor home to make way for potential new arrivals – if we get any they will be smaller and more vulnerable. It doesn’t seem right that we have to take such precautions against bad weather in July. It’s been far too cold and far too stormy and far to wet, and right at the point of us having new ducklings hatch. Poor things were shivering away, and mum is good and broods them – but I think maybe a fully grown duck doesn’t feel the cold like a fluffy duckling does. In the middle of the horrible weather I found a duckling left out in the rain, breathing its last, whilst mum and the other seven were tucked up in the little house. I warmed him up (yup duckling down the t shirt time) brought him back to the house – couldn’t put him under the heat lamp as that is occupied with chicks, so improvised a box and some tubs of warm water next to him, and after a bit he was dry and squeaking loudly and stomping about. So I took him back down to mum and he joined the crowd, only standing out by being the dry one. But the next day, a duckling was found dead. I’m guessing the same one? but they all look the same in this batch. I don’t know if they got too cold (we did our best setting up shelters and windbreaks) or if she is a bad mum, if he just wasn’t right. Seven ducklings still going strong.